When companies from Western Canadian cities such as Toronto, Winnipeg, Calgary, Edmonton or Vancouver want to offer products and services in Eastern Canada it is certain that Montreal is their first-choice business place for several reasons. In Eastern Canada, Montreal is host to the majority of major companies. 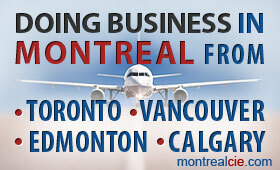 Montreal is the business ambassador in Eastern Canada. The MontrealCIE Business Centre enables entrepreneurs and professionals from Western Canada to do business in Montreal easily by providing an innovative propulsion service in business by sharing offices with a local Montreal company and by using its staff of engineers, technicians and managers if necessary; which has, of course, several advantages. The availability of resources to search for and find land and buildings and do the mounting of a project. Companies from Vancouver, Calgary or Edmonton settle in Montreal in order to have access, not only to Montreal, but to all of Eastern Canada. The great distance of 3 to 4 hours by plane that separates them from Montreal forces companies in Western Canada to have a large-scale market strategy. Companies from Vancouver, Calgary or Edmonton even choose Montreal as a place of business, not only to reach consumers in the Province of Quebec and the Maritimes, but also to be able to have a window on Europe with France, the UK, Germany, Spain and Italy. The French language, its multicultural character and the geographical location of Montreal give it more than enviable attributes to facilitate relations and national and international trade. costs to settle in Quebec. Now, the innovative concept of MontrealCIE allows companies from Vancouver, Calgary, Edmonton and Toronto to have easy access to a business office to share in Montreal with a company with lots of experience and use its services. Access to all of Eastern Canada. Doing business in Montreal and have access to Eastern Canada for companies and business people in Toronto, Calgary, Edmonton and Vancouver is now possible with MontrealCIE.